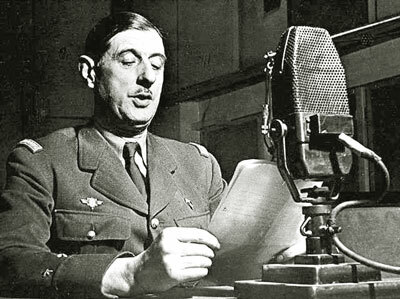 Today French radio amateurs have finally been granted permission to operate in the region 7.1 to 7.2MHz. Vive la France! A week ago I received a Yaesu VX-8GR VHF/UHF APRS hand held transceiver with GPS. The transceiver performs as expected except in one extremely annoying respect - its GPS takes a very long time to get an initial fix on its position after switching on the radio. It cannot get a fix from inside the shack at all. By contrast, my HTC smartphone will get a fix in a couple of minutes whilst sitting in its charger cradle on the shack desk. Or at least, it did. This morning I noticed on aprs.fi that the last reported position of my smartphone, G4ILO-10, was somewhere in Somerset. I started the APRSISCE application with the intent of "bringing it back home" by sending a position report with the correct location. But after ten minutes the phone had not managed to get a fix. I switched off all my radio equipment in case one of them was an interference source, and rebooted the phone, and eventually after several more minutes it obtained an accurate fix. I am beginning to suspect that something is interfering with GPS reception in the area of my house. If you Google "GPS interference" you will find links to numerous articles and research papers raising concerns about what is apparently an increasingly common problem. One article states that a directional television receiving antenna widely available in the consumer market contains an amplifier which can emit spurious radiation in the GPS L1 frequency band with sufficient power to interfere with GPS reception at distances of 200 meters or more. Other potential interference sources include spurious outputs from TV transmitters. Another website states that "We are seeing increasing evidence of GPS interference and also apparent erratic behaviour (e.g. mis-reported location)" and provides a form for reporting cases of interference. This page provides links to two reports on the issue which unfortunately require registration in order to access them. Have other amateur GPS users experienced difficulty in receiving the satellites or an increase in inaccurate position reports? For many GPS applications the effects of this could have rather greater impact than a radio ham's inability to report his position to aprs.fi. Perhaps the US administration was rather hasty in its decision to decommission Loran. Steve, GW7AAV, was quick off the mark to post about the announcement yesterday on the website of DR@F, the French association of amateur digital mode operators, that D-Star has been ruled illegal in France. The reasons for the ruling, if I understand correctly, are that D-Star permits a radio to be connected to the internet (which is apparently illegal in France) and that it breaches rules prohibiting encrypted communications on grounds of national security because parts of the patented proprietary AMBE codec are undisclosed. The group is appealing for all European amateurs to sign a petition to the European Parliament against the ban. No doubt this will have as much of an effect as the two petitions to the British Parliament to get interference-causing internet-over-mains-wiring devices banned. Issues like this illustrate what a hopeless idea the European Union really is as it attempts to harmonize things between member states while countries (especially France, which started the EU but implemented only the directives that suited it) stick tenaciously to their own different rules and regulations when they want to. I'm not sure if it is true that French amateurs are not permitted to connect radios to the internet, as if it were, Echolink nodes and APRS gateways would also not be permitted, and a quick check of some relevant websites show several of each with F callsigns currently operating. As for the argument that transmissions are encrypted, whilst the closed and proprietary nature of the codec does prevent someone from designing their own decoder, the chips (and indeed D-Star radios) are readily obtainable allowing anyone who wishes to do so to monitor communications. I am not, as regular readers know, a fan of D-Star, but this looks to me a bit like the result someone who is also anti D-Star trying to abuse their position to get it made illegal in France. I hope our French comrades are successful in getting this ban lifted. Ofcom, the UK telecommunications regulatory authority, has announced that it will pass the responsibility for investigating reports of interference to TV and radio services to the BBC from July 1st. On that date, members of the public experiencing interference to radio or TV should lodge a complaint with the BBC using a web form, which may advise them of issues such as a local transmitter fault. Some UK amateurs have expressed concern about the possible effect of this change, but I don't consider it likely to make much difference. As far as I can see, Ofcom will still be responsible for issues of interference to amateur radio such as that caused by PLT devices. These days, TVI and BCI are fairly infrequently experienced and almost always caused by a poor or faulty antenna installation or receiving equipment. Putting the BBC in charge of investigating complaints of interference to its own services makes a lot of sense. I've never been a fan of Apple products. I have always felt that Apple was a brand aimed at fashionistas concerned more with style and the coolness associated with owning a particular product than with practicality. So for example phones were made with non user-replaceable batteries in order to make them very slim. Now it appears Apple's engineers have made another slip-up in the name of style. 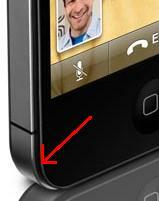 Users of the new iPhone 4 are reporting that they lose the signal whenever they hold the phone. Apparently a section of the stainless steel band that runs around the phone is used as the antenna, and the part that radiates is on the lower left hand side - nicely surrounded by the fleshy palm of your hand if you hold the phone in your left hand. It seems to be that Apple could do with a radio ham on its design team. Even the newest Foundation licensee - in fact even a CBer - could have told them that antennas are supposed to point upwards. There was recently a change of crew at the International Space Station and one result of that has been the reappearance after a long absence of the packet radio digipeater on 145.825MHz. When the Space Station passes over you can receive some very strong signals from it. I have decoded APRS beacons on a VX-8 handheld standing on a window sill inside the shack. But it is even better to use the main station, then you can see the positions of the stations you received on a map. When using the ISS you need to use different settings to what you would use for terrestrial APRS. Digipeating, if enabled, must be turned off. 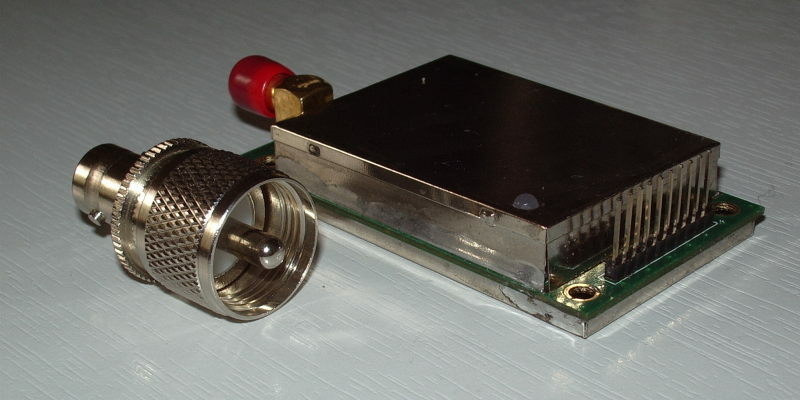 You want to be connected to APRS-IS so you can gate received packets to the internet, but you don't want to send anything received from the internet out to the ISS. You probably don't want to display data from the internet on the map, to leave it clear to show those stations received by the radio. If you want to transmit through the ISS yourself you must also change the APRS path to "ARISS". After thinking that we really need an ISS option in APRSISCE/32 for this it occurred to me that all I needed to do was make a copy of the program in a new folder, then I could change the settings however I wanted without affecting the copy I use for terrestrial APRS. It worked fine. It was fun to see the stations heard via the satellite show up on the map, although when the map is zoomed out to cover such a large area the icons are hard to see. It was also amusing to see that the icon for the ISS's own beacon was a bicycle. Perhaps someone should tell NASA! After several abortive attempts to get my own beacon digipeated by the Space Station I set the transceiver to Narrow FM and got through on the first attempt using just 10W to my 300ohm ribbon cable Slim Jim in the attic. The proof is in the map of stations heard through the ISS at ariss.net. Not a very useful activity perhaps, but fun to try. A recent addition to the G4ILO shack is a new Yaesu VX-8G hand held transceiver. In case you are thinking that I need professional help over my addiction to hand held radios you may be right - however a week or so ago I received an email from someone who has a collection of 150! Long-time followers of my blog may recall that less than a year ago I bought a Yaesu VX-8E APRS transceiver with GPS. However I found that the usefulness of APRS was limited by the lack of digipeaters and internet gateways in this part of the world. I decided to use a smartphone based APRS client, APRSISCE instead and sold the VX-8E shortly afterwards. Using the cellular network instead of amateur radio has its advantages but it eliminates the interest of seeing how far a little 2m RF can go. Interest in APRS has increased in this area over the last few months so I decided to give RF another go. In the meantime, Yaesu brought out an improved version of the original VX-8R called the VX-8DR and a lower cost version called the VX-8G. So I didn't regret my decision to sell the VX-8R as it allowed me to acquire the updated version. One of the things I really disliked about the VX-8R was the clunky way the GPS attached externally to the radio (and the absurdly expensive fixing bracket.) The VX-8R (and the updated DR) has a number of other features that I never used and didn't need in an HT: 50MHz coverage (including AM), short wave receive (which was useless anyway without an external wire antenna), a barometer/altimeter and a temperature sensor. Nor did I care that it was submersible. I did lose a brand new HT in the Solway several years ago, but as I didn't immediately notice it had fallen off my belt I never found it again. The VX-8G lacks these unwanted features and can be set to vibrate when you receive an APRS text message - a new way to get a thrill out of amateur radio! More importantly it has the GPS built into the radio which makes for a much neater package. It costs about the same as a VX-8DR without the GPS option. 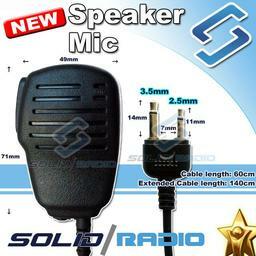 The VX-8G is not available yet in the UK so I purchased it from Solid Radio, an eBay trader based in Hong Kong. This was the most expensive thing I have ever bought from a Far Eastern trader and I felt like I was taking a bit of a gamble, but the radio arrived in just over a week and with no unpleasant surprise on delivery. The VX-8G looks very similar to its older brother but is a little slimmer and lighter. I seem to remember that the body of the VX-8R was metal, or else it had a substantial chassis that added to the weight. With the standard battery installed the VX-8G is noticeably lighter than my Kenwood TH-F7E. The Yaesu's GPS takes much longer than the one in my hTC smartphone to acquire a signal. In fact after waiting several minutes on first turning on the radio I started to worry that the GPS wasn't working so I stood it out in the garden on a table where it eventually established its position. On subsequent occasions it has still taken a few minutes to fix its position which is a bit annoying. Operationally the radio appears to be the same as the VX-8R and the menus are very similar. One of the new features is SmartBeaconing which varies the frequency of position reports according to your speed and whether you have changed direction. There are different settings for this depending on whether you are walking, cycling or driving. The original model would only send position reports on a fixed time interval. Once I had enabled SmartBeaconing it sent a very accurate track of my walk. It is too early to say with any precision what battery life is like but initial impressions are that with the GPS enabled it is pretty poor - a criticism that unfortunately is also true of the smartphone. I used to have a navigational GPS called an iFinder GO2 which ran for about 18 hours on two AA batteries so low current consumption GPS devices do exist - why doesn't Yaesu use them? 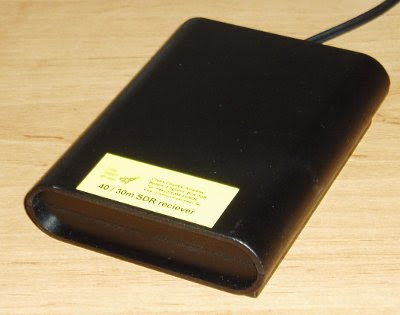 In the VX-8 radios when you use APRS the problem of short battery life is compounded by the need to disable the power saver (which causes the receiver to listen in short bursts rather than all the time) so you don't miss the start of a beacon or message sent by another station. The VX-8G uses the same batteries as the VX-8R and DR models so a higher capacity pack available, but it is quite expensive. I am pleased with the VX-8G so far and am looking forward to discovering where I can be tracked from. I think APRS holds some of the same fascination as WSPR on the HF bands in that it is interesting and sometimes surprising to see how far your low powered signals can travel. I don't know when the VX-8G will be introduced in the UK or what its UK retail price will be but I expect it will still be quite an expensive radio. A pity, as I think the cost puts a lot of people off discovering APRS for themselves. 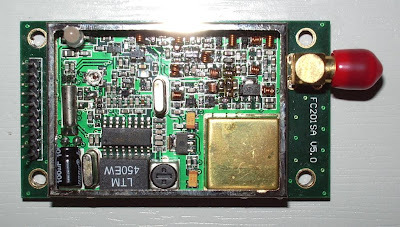 I did a quick lash-up of the UHF FM transmitter module I received a few days ago which I was planning to use in a low-power Echolink node, mainly just to see if it worked. It did, but I discovered a small snag. The audio output isn't squelched. The Echolink software requires either normal squelched FM audio or a carrier operated squelch signal on one of the serial port control lines. As neither of those is provided I guess I am going to need to generate a squelch signal derived from noise. But as I am not knowledgeable enough about electronics to design my own circuit I am going to have to find one first. This appears easier said than done, though there seem to be a surprising number of patents on the subject. It isn't an urgent problem as I'm not in any hurry to build this project. I'll probably have more enthusiasm for it once the gloomy autumn weather starts. Someone commented in the eHam ratings for my blog that I spent too much time complaining about retailers. I'm sorry about that, I only tell it how it is, but it appears that no-one in this country is capable of doing their job properly. Perhaps the government's policy of sending 50% of people to university means that most people are over-qualified for the job they do and are too bored by it to actually think about what they were doing. Phase 2 of my shack renovation was completed earlier this week. It should have been finished a couple of weeks ago. Olga designed and ordered a system of wall units including shelves, cupboards and a bureau with a door that drops down to form a working surface. This bureau is to be my workbench - now I can start something and when I have done enough for one day I can just close the door on it so everything stays looking tidy. The consignment arrived consisting of all 11 boxes as marked on the shipping labels. However as we started to assemble it we found that a few bits, including the entire bureau, were missing. On contacting the retailer they were sure that 12 boxes had been sent, but the bureau was never discovered and they had to order a new one from Sweden - hence the delay. My workbench is now separate from my operating area so I can no longer use the Diamond power supply that powers my radios to power my projects. So I needed a variable power supply for the workbench. Yesterday I was pleased to win in an eBay auction a refurbished variable power supply from Rapid Electronics for about half what a new one would have cost. The courier delivered a large parcel this morning which was labelled with my address, but when I opened it I found four retractable mains cable extensions that had been ordered by Workington Sixth Form College, together with their invoice. So now I have to wait in while Rapid arranges for its courier to collect the mains extensions. Whether I will ever see the power supply, or whether it will just vanish like our original bureau, remains to be seen. I'm sure some readers must be thinking "take a chill pill, mistakes happen." But mistakes seem to happen rather too often, if you ask me. If you were in the mail order business, wouldn't you put systems in place to ensure mistakes like this don't happen, because they annoy your customers and cost money to rectify? Rapid Electronics "operates a Quality Management System to BS EN ISO 9001:2008." What a load of spherical objects that is. 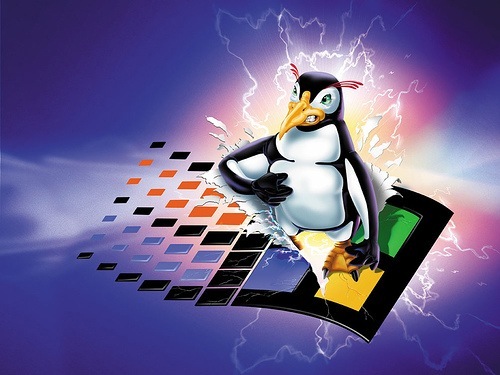 While on the subject of retailers, last week I sent an email to a company that advertises notebook PCs with Linux installed, asking for a quote for a system for my business. I have not received a reply. Why does that not surprise me? This blog is meant to be about my hobby, amateur radio. Occasionally I have given in to the temptation to blog about some other event that has affected me, or let off steam about some topic that has annoyed me. But as I discovered a few months ago when a couple of the American ham radio blogs I read decided to vent about Obama, health care and other issues that Americans care deeply about, it can be very disconcerting to encounter far off-topic subject matter in a specialist blog, especially if the opinions expressed are ones with which you profoundly disagree. So in recent months I have tried to resist the temptation of controversial posts. Sometimes I still get the urge to write about these topics, though. So to satisfy that urge I have started a new blog. Its title is One Foot in the Grave; the subtitle is Ramblings of a real-life Victor Meldrew. British readers who have seen the BBC comedy series of the same name will know what to expect from this. Readers from other parts of the world will have to see for themselves, though perhaps much of what I will be writing about won't be of much interest to them anyway since it is going to be mostly about the trials and tribulations of life in the UK. Nevertheless I hope that a few of you may find it worth following One Foot in the Grave and even telling other people about it. APRS - Putting ham radio on the map. It's quite a long article, but do read it if you have the time. I hope that it will explain what APRS is for to the many people who don't seem to understand, and even more I hope it will encourage more people to try it. If you like the article and think that it will help to spread the word about APRS, please post links to it anywhere you think would be appropriate. 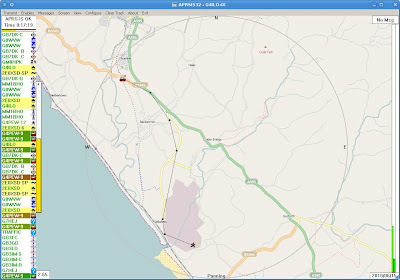 Linux users now have an alternative APRS client to Xastir. It's called APRSIS32 for Win32. I have discovered that Lynn KJ4ERJ's Windows APRS client runs almost perfectly under the Linux OS using wine, the Windows compatibility layer. It's pretty easy to get APRSIS32 going. Just download the Win32 version from the APRSISCE Yahoo group, save it into a folder somewhere under .wine/drive_C and run it. The program will start downloading maps so you can zoom in and set your home location. The only problem is, you can't see them. By default the maps are displayed semi-transparent and it appears that wine doesn't support transparency. So you will need to keep hitting the right arrow key which increases the opacity until the maps are 100% opaque, when they should appear. Check the APRSISCE/32 documentation wiki for more information. There are a few screen redraw issues and the automatic updater always seems to fail, but these are minor issues. APRSIS32 uses code common with the APRSISCE version that runs on Windows CE mobile phones. These use a pretty small subset of the features available to current Windows software so by happy accident the program avoids doing things that wine doesn't support which prevent more complex programs like Ham Radio Deluxe from working. I haven't tried the program with a GPS or a TNC as I don't have them, but since these are just standard serial connections which are certainly possible under wine that is unlikely to be a problem. Lynn seems pretty keen to tackle the problems that I have discovered. In the meantime, the program still seems to work pretty well, so if you use Linux and are interested in APRS why not give APRSIS32 a try? I wish Murphy, the patron saint of things that don't work, would leave me alone. It's a bit frustrating reading on other blogs that someone spent a weekend and ended up with some perfect working piece of gear while I spent several hours just trying to get a computer to talk to a radio. Although APRSIS32 now supports transmit and receive using AGW Packet Engine which can use a soundcard as a modem I have never decoded a single packet, nor have my beacons been reported as heard by anybody. I started to wonder whether my cheap USB dongle - one of those things about the size of your thumb with a USB plug on one side and two 3.5mm stereo jacks on the other, that cost next to nothing - was up to the job. It had worked acceptably well for Echolink, but although my braaaps sounded to me like packet, they might not sound enough like packet to someone else's decoder. My computer's on-board soundcard is in use by my K3 so there was no point in trying that. But I did have another slightly better USB audio dongle being used for PC sound, so I decided to swap them over. I removed the cheaper dongle in order to better access the audio sockets and when I replaced it I received a message from Windows that "One of the USB devices attached to the computer has malfunctioned" and it disappeared from the system. Giving up on computer sound for the moment I proceeded to try to test APRS packet transmission using the other dongle. But although I was receiving audio OK and keying the transmitter I was not transmitting any audio! I fished the interface out from behind the rigs - a trying task ever since I installed the new shelving - in order to test it with my netbook and FT-817. It worked perfectly with Fldigi. Perhaps a bad connection? Back in position connecting the Icom to the shack computer and still no transmit audio, even though I could plug the computer speakers into the headphone output and hear the braaps being generated by the software! Eventually it finally dawned on me that the AGWPE soundcard software only generates audio on the left channel. My radio interface was wired to the right channel! The cheapo USB audio dongle (that was now malfunctioning) presumably had a mono output so I was getting audio on both channels. The better one was generating proper stereo so there was no output on the channel I was using. D'oh!! Fixing this ought to have been simple. Just open up the interface and switch the wires so the one from the left channel provides the input instead of the right one. But of course, it wasn't. Even though the cable from the stereo jacks used in this interface had no less than four insulated wires within the screening, only one was connected to anything - the tip (right channel) of the plug. The ring was unconnected. So I had to take another audio patch lead, cut it in half, and use that to make new audio cables for the interface using the left hand channel. Finally, it appears to be working, though I have still to decode an APRS packet. But now I have no computer audio because the other USB dongle is still broken and the connecting cable was cut in half to get the interface working. I came this --><-- close to saying "the hell with all this" and ordering a Signalink USB interface this morning. An antenna analyzer is a very useful piece of equipment and I have never regretted buying my AA-200, though I probably wouldn't get one now with the current model priced at £410.00. Even the basic MFJ-259B which is not exactly renowned for its quality construction will set you back £260.00. 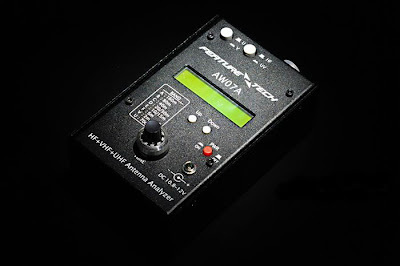 So I was interested to discover that the Chinese have entered the market with the Feature Tech AW07A which can be bought on eBay for a much more reasonable £160.00. The unit can measure RF impedance and SWR from 1.8 to 490MHz (making it more directly comparable to the MFJ-269B model) as well as measuring capacitance and inductance. It may be used as a non-precision signal source and frequency counter, and with the addition of an inductor may be used as a dip meter. It looks like a nice addition to any amateur's toolkit. I received an email from a German CB operator named Dieter (I presume he is a CB operator from the callsign) asking if I knew of a program to design a SuperMoxon antenna for 27 or 28MHz. I replied, as I would have done to a licensed amateur who had asked the same question, that I didn't. The SuperMoxon was designed and made by Ron, GW3YDX. Only he knows how he designed it. My reply to Dieter's gmx.de email address bounced back with the message: "Sorry, your envelope sender has been denied: The recipient 550 5.1.1 does not want to receive mail from your address." 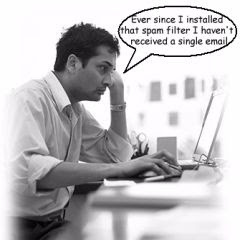 I guess this has something to do with preventing spam, since I read recently that a lot of spam comes from fake Gmail addresses. But if gmx.de can't distinguish spam from real email - something Gmail does extremely well, and one reason why I've been very happy to use this free email service - then perhaps it should stop using half measures and turn off email altogether rather than leave its customers wondering why they don't receive replies from some of the people they contact? A recently published paper suggests that the peaks of the next two solar cycles are likely to have greatly reduced sunspot activity similar to solar cycles 5 & 6 during the Dalton Minimum of 1790 to 1830. Solar records going back over 11,000 years have been correlated with planetary ephemeris and the results appear to show that solar cycles are affected by the position of the solar system's outer gas giants Uranus and Neptune. However I'm not sure what is more depressing: the thought that I'm unlikely to see a solar maximum in which ten metres is wide open for worldwide propagation during my lifetime, or the reaction of some of our fellow amateurs to the news on QRZ.com. "WHY CRY about it? Buy a BIGGER antenna & amp for the bands you enjoy & have FUN!" read one comment. "All the whiners about hams using kilowatt amps will be crying constantly. Life is too short for QRP." went another. 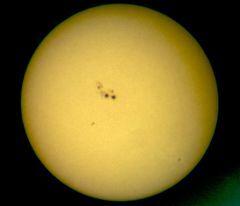 QRPers have been having fun throughout the extended solar minimum of the last few years and will no doubt continue to do so despite the dearth of sunspots. 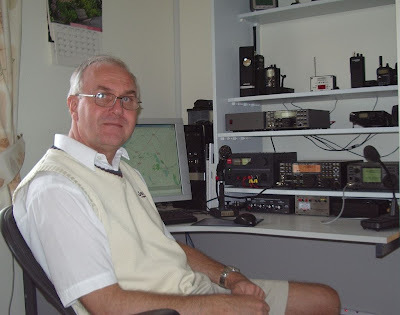 What is sadder, in my opinion, is the passing of an era when radio amateurs were all thoughtful, intelligent, articulate, considerate and gentlemanly individuals who treated their fellow enthusiasts, whatever their interests, with respect. Show me a tidy shack and I'll show you the shack of someone who doesn't spend much time tinkering with equipment, or someone who has been nagged by his XYL to make the shack tidy and curses every time he needs to connect or disconnect something - which at G4ILO seems to be several times a week. When I switched on the computer this morning there appeared to be a Sporadic-E opening building on 2m to the south east so I switched on the IC-910H and turned the SuperMoxon in that direction. Nothing was heard, so I switched to the vertical instead and was puzzled as to why the band noise was so much greater on the beam than the Slim Jim. The opening passed, as all such openings have this year with nothing heard or worked, and I decided to investigate. I switched the computer off and the noise fell to the same level as on the vertical. Eventually, after much trial and error and cursing because the cables can only be reached by groping blind (with the aid of a shaving mirror or a picture of the back of the rig) behind the equipment I established that the problem was the serial cable providing PTT control to the interface connecting the 910H to the computer. Even when it was disconnected from the radio, plugging it in to the serial port on the computer caused the noise level to jump up. This was a cheap interface I'd bought some time ago for the FT-817. The serial cable supplied wasn't screened, but I'd shortened it to use with a USB to serial adapter without a lot of spare cable lying around. This had resulted in it being too short to use with a real serial port, so I had replaced the cable. I had used screened cable for the replacement, but although I had connected the copper shield to the GND pin of the RS-232 port, it wasn't connected to the body or shell of the plug, which in any case was plastic. I managed to solder to the metal flange of the plug, the bit that pushes on to the socket on the PC, and connect a short wire from that to the GND pin and the shield. That seemed to do the trick, and the noise level is now the same when the beam is pointing towards the shack as it is on the vertical. Problem solved, for once! Nevertheless I do sometimes wonder if computers are worth all the trouble they cause to us radio enthusiasts. Last night for the first time in a very long time I operated RTTY. I made ten contacts in the BARTG RTTY 75 contest. The reason was that Elecraft had released a beta version of firmware for the K3 that enhances the built-in DSP modems to support the 75baud RTTY mode that was being used in the contest. Now that the K3 also supports a way to get decoded text into a computer program I thought it would be fun to give it a try. For those unfamiliar with the K3, the transceiver boasts a built-in Morse decoder plus DSP based modems (encoders and decoders) for PSK31, standard 45.5baud RTTY and now 75baud RTTY. As the K3 doesn't allow direct input from a keyboard, the usual way to use this facility is to send text using a Morse paddle and read received text on a scrolling 7-character window of the K3 display. However, using a program like KComm it is possible to send and receive text using software commands over the CAT interface as well. Since, like most things that require good motor skills, I'm hopeless with a paddle (or key) at anything much above 12wpm, that's what I did. I installed the new firmware and it decoded 75baud RTTY signals perfectly, so I waited for the contest to begin. After it did, I soon found that although people were hearing me they weren't decoding me. I got lots of QRZ?, ??????? and SRI NO PRINT. I started to get frustrated and began thinking that RTTY is an obsolete mode that has no place in the 21st century because I know I could have made contact with these stations easily using PSK31 and a fraction of the power. I decided to switch to soundcard mode and use Fldigi to try to make some contest contacts, and then found that people were replying to me on the first call! So clearly there was something wrong with the RTTY being generated by my K3. This morning I tried receiving some of my transmitted RTTY using the FT-817 and Fldigi on my NC-10 netbook. When the RTTY was generated by Fldigi it was received perfectly. However when it was generated by the K3 I received gibberish unless I switched the K3 to REV DATA mode (i.e. reverse sideband.) Since I was receiving the RTTY perfectly OK using the normal sideband I presume that the K3's transmitted RTTY was reversed. I have reported it to Wayne and await comments. Unfortunately I did have some problems with KComm as well. After a while, it started aborting the transmission of any macro after the first few diddles. Like many programs, it has grown to the point where it is hard to understand what is going on any more and my interest in programming has fallen off a cliff in the last few months. I don't know if I will ever get around to fixing the problems and releasing the final version. I do like using it, and KComm is the only program that really supports the K2 and K3 properly because it doesn't treat them like a Kenwood TS2000 (whose command set it nominally shares) but was written to take account of the way these radios actually work. I bought a copy of Practical Wireless today and noticed the following in the Waters and Stanton ad inside the front page. 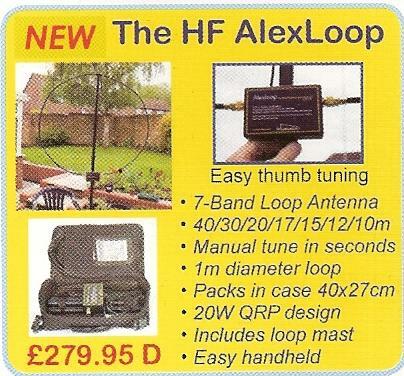 It isn't often words fail me, but three hundred quid delivered for a hand held QRP antenna?!? I guess it would perform about as well as my home-made Wonder Loop. I need a new office notebook. Yesterday, while working on something a thin bright blue vertical line appeared on the screen. It's still there this morning. I guess the TFT display is going on the fritz. Well, this Toshiba Satellite M60 is 4 1/2 years old and has been in heavy use 10 hours a day 5 days a week for nearly all that time, so I can't complain. Time for a replacement. The trouble is, I use Linux on my work PC and it doesn't seem to be possible to buy a high-spec laptop with Linux ready installed and working on it. Obviously, I'd like to avoid paying for a copy of Windows I'm not going to use. If you've ever seen it on sale, you'll know that the cost of a copy of Windows is quite substantial. Since, thanks to Microsoft's obsessive copy protection, it will be an OEM copy locked to the hardware and without installation media I won't even be able to install and use this copy under VirtualBox if I want to. But also, as it's a work machine, I'd like to buy one on which the operating system is supported and all the hardware works with it. I've installed operating systems far too many times in my life to have any enthusiasm for doing it one more time, and I know from experience that laptops often contain hardware that isn't supported out of the box by Linux. When we bought a new laptop for Olga a couple of years ago I bought a budget HP laptop that came with Windows Vista - which ran so slowly it took two hours just to finish it's automated initial setup routine. I installed Linux but had an anxious couple of hours as I couldn't get the wi-fi adapter to be recognized. I did in the end, and the chances are that any problems with whatever system I got this time could be resolved after hours of ferreting through support forums. But that long ago ceased being fun and I would really prefer to avoid it. However, it is virtually impossible to buy a PC or laptop with Linux installed and supported. Dell appears to offer a small selection of laptops preinstalled with a long superseded version of Ubuntu. There is also a firm called The Linux Emporium that offers a limited range of Lenovo laptops with Ubuntu installed on them. But they have nothing that meets my spec. This old Toshiba has a 17in display with WGXA+ 1440x900 resolution and I'm not going to settle for anything smaller. So it seems the only way I am going to get what I want is to buy the laptop I want, pay the Microsoft Tax, throw away Windows and do my own Linux installation. Is it any wonder that Microsoft enjoys such a virtual monopoly when people who buy PCs don't even know there is an alternative? Why hasn't the EU done something about this? It has taken months and cost millions to force Microsoft to install a screen that lets people choose what web browser to use, despite the fact that a) the browser market already has healthy competition and b) switching browsers later on if you want to isn't a problem. But it has done nothing about a situation that forces people to pay for a Microsoft operating system even if they know enough not to want one. Even if computer manufacturers don't want to offer Linux because they don't wish to support it, they should at least be required to offer the OS as an optional extra so those who don't want it don't have to pay for it. I often use WSPR, the very narrow band, low power, automatically reported beacon mode, which operates in a 200Hz wide band and reports the frequencies of received stations to 1Hz accuracy. I also sometimes use other digital modes where I want to be able to set my transceiver to a specific frequency with confidence. So one Elecraft K3 add-on that I had been eagerly awaiting was the KREF3 board that was supposed to allow you to lock the K3 reference oscillator to an external frequency standard. In fact, readers of this blog may recall that only a couple of weeks ago I posted an item about rubidium frequency standards being sold on eBay. A few days ago Trevor G0KTN, who is actually the person responsible for turning me on to WSPR in the first place, posted a question to the Elecraft reflector asking for a comment from Elecraft as to when the KREF3 might be available. When no answer was received he asked again, and eventually received this reply from Eric WA6HHQ: The KREF3 is not in current planned development. I thought we had removed the references to it in all of our docs. Is it still showing up somewhere? It is still showing up in the copies of the manuals I have. There is still a labelled, blanked-off hole for it on the back of my radio. More importantly, it showed up in the specification and brochure that Elecraft produced at the time I ordered the radio. In the past I have been flamed quite harshly by members of the Elecraft fan club for suggesting that Elecraft had broken promises or even acted dishonestly by failing to provide advertised features. But is it being honest, when deciding not to provide a feature that was initially advertised and promised, to quietly delete all references to it and hope no-one notices? Perhaps Elecraft figured that since most hams are in their 60s or later we all have Alzheimer's and will have forgotten the KREF3 was ever offered. For someone as plagued with HF band interference as me this sounds like a sick joke or an April 1 spoof that passed it's read-by date. The Electromagnetic Compatibility Industry Association (bet you didn't even know there was one) has announced a contest to see who can detect interference furthest from a power line adapter installation. Yes, really. There are two prizes: the Long Distance Award (LDX) for the person who detects interference the greatest distance from the installation, and the Most Typical prize (MTY) for the entrant whose detection distance is closest to the median value. Well I suppose when interference blots out HF entirely we need to use our radios for something. I believe a CQ WW Wi-Fi contest in the offing. You collect SSIDs for multipliers. Double points if the network is unencrypted. I'm sorry for another non-radio related post but as someone whose wife is an immigrant from outside the EU I can't let this news pass by without comment. The British government has announced today that it is bringing forward measures to require people from outside the EU who marry British citizens to demonstrate a knowledge of English in order to obtain a visa. I think this is discriminatory, insulting and a denial of what ought to be a basic human right to be able to live in your own home with the person you have chosen to marry. Although Olga knew sufficient English when she came to the UK to have met the requirement had it existed at the time, I know of British men who have married women they met whilst working or holidaying in Russia, China or Asia who spoke little or no English at the time they came here. I'm sure most of them learned the language after they got here, which of course is now (quite rightly) a requirement for gaining British citizenship. But there is a world of difference between allowing someone to learn the language in their own time, if they choose to (after all, gaining citizenship is not essential to live in Britain) once they are here, instead of compelling them to do so before they are allowed to live in the country that is home to the person they married. It's the difference between treating someone with respect or as a second class citizen. I'm sickened by some (the majority, actually) of the small minded comments supporting this measure on the various blogs and news media forums. It seems that most people in this country view all immigrants as idle spongers who contribute nothing and only come to the UK to claim benefits and become a drain on public services. I'm sure that's true of some, but all of those I know are hard working and pay their taxes. I also know of many born and bred Brits who prefer living on benefits to getting off their backsides and earning a living. Perhaps we should cut benefits and make them less attractive? If it's OK to stereotype immigrants then I guess it's also OK to stereotype working class Brits as lazy uneducated whingers who think the world owes them a living just because they are British, and who complain about immigrants taking their jobs when the truth is employers prefer immigrants because the British are idle, useless and far too prone to "take a sickie." There was a TV programme a couple of months ago where firms that employed East Europeans were persuaded to hire some unemployed Brits and they either were late for their first day, called in sick, or had egos that couldn't take being shown up for being too dumb to do even a simple manual job properly. I'd employ a Pole instead of a Brit any day. There is a latent racism in British society which is pandered to by the right wing mass media, with the result that the government can get away with policies like this that go completely against the old British tradition of fairness. It's perfectly reasonable to expect that someone coming to live in Britain has a means of support, whether that is a Swiss bank account, a job or a husband. But to keep people out because they can't speak the language when they have a husband to support them (spouses from outside the EU aren't even allowed to work for the first two years in another nonsensical piece of regulation) is pure discrimination which I'm sure we'd be up in arms about if it started to be applied when we want to live in their countries. It's well known that the British are useless at languages. When in Rome - or Paris, or Madrid, or Moscow - JUST SPEAK ENGLISH LOUDER. This morning I see that Peter G4NKX has written on his blog about "Personal Web Targeting". Peter wrote it after noticing that ads were appearing on various sites that were related, not to that site, but to things he had previously been looking for. These days I earn my living from internet marketing, so it is something I know a bit about. I was going to comment on Peter's post but it would have been rather a long comment. In the past I have been asked by a couple of my readers to write about topics related to running a website and blog but there have always been other topics that took priority. Someone even slammed my blog's rating at eHam because "the ads were annoying." So this is perhaps a good opportunity to tackle this topic. If it is of no interest to you, you may as well skip the rest of this post. First, why ads on websites? Put simply, there's no such thing as a free lunch. Web hosting costs money. If you run a professional site and need to employ people to run it, paying their salaries costs money too. Sites like Fred AA7BQ's QRZ.com cost a lot of money to run and the ads allow people like me to access it for free. If you don't like the ads, Fred provides the option to remove them by paying a subscription. If you don't want to pay, you also have the option of not visiting QRZ.com. I certainly don't expect Fred to pay the running costs out of his own pocket. The same goes for most of the sites you visit on the internet. If there weren't ads, most of the web wouldn't exist and a lot of the rest would be subscription-only, as the websites owned by Rupert Murdoch's News Corporation have recently become. It will be interesting to see where that ends. I've sometimes been asked why there are ads on my website. I'll be as brief as I can. For best part of the last 20 years I have worked freelance. As the demand for my services declined due to recession, people who hired me moving on and so on, I was forced to look for new ways to make money. I stumbled into internet marketing more or less by accident and since my ham radio hobby site was one of my most popular sites I thought I'd try advertising on it. I certainly couldn't live off the income generated by this site, far from it, but during times when my income only just paid the bills the fact that my hobby made a bit of money allowed me to resist selling my gear and even make the occasional new purchase. Currently my business website makes us a comfortable living. But as I will eventually be retiring without the benefit of a final salary or inflation-linked pension scheme, in fact without much of a pension at all, I will soon be back in the situation where hobby expenditure is a luxury. So I expect I will be trying to make pocket money from my hobby right up until the day I finally become a silent key. The issue Peter raised in his post was about ads appearing that related to something he had previously searched for, not the site he was currently on. Though he doesn't mention it specifically, I presume he is referring to Google, which recently changed the way its context based advertising service AdSense worked. Previously, the ads that were displayed on a web page through the Adsense program were related solely to the content of that web page. When I first tried AdSense on my sites I felt that it actually enhanced the value of the pages. I have found out about radio products I might otherwise never have known about through the ads that have appeared on my and other ham radio web pages, so on balance I consider AdSense a good thing. Personally I think this is a step backwards. I would prefer people who visit my site to see radio-related ads primarily, not ads about bathroom fittings or whatever else they have been looking for. I haven't observed a significant increase in advertising revenue since Google introduced its new policy. But in this new tough economic environment where people have to justify every cost website owners have to take what the advertisers will give them. I don't think the subscription-only model is going to work for News Corporation, it certainly isn't an option for hobby sites like mine (or even QRZ.com) and I am not going to forego my small but still worthwhile advertising earnings just because some people consider that advertising invades their privacy. You open a newspaper or watch TV and see ads about all kinds of things that aren't relevant to what you're reading or watching. Why does it become such a big deal when it's on a web page? There are also software tools including plug-ins for Firefox that can block ads from appearing in your browser. However I hope you don't use them. Personally I regard blocking the ads that help pay to keep a site running as a bit like stealing. As I said earlier, there's no such thing as a free lunch and every website that you visit for free is costing somebody something to provide it. Cross Country Wireless recently introduced a new product, a built, boxed and ready to use SDR receiver that is optimized to work with the bog standard sound card provided with every computer. It covers two 48kHz segments which may be on one or two bands using a switched local oscillator. At £49.95 it looks like something of a bargain. I was looking at the product's web page this evening and the thought occurred to me that this might make a rather good inexpensive option for a panadapter for the Elecraft K3. It would need a different crystal to cover the K3 IF output frequency which is 8.215MHz, but that shouldn't be a problem. CCW might even offer this as a stock option if there was a demand for it. As the receiver covers 40m and 30m everything else should work OK unmodified. The key point would be whether there is adequate isolation to prevent the local oscillator leaking into the K3 IF and desensitizing the receiver - the reason why most people use a buffer amplifier when using SoftRock boards for this purpose. I don't have a great urge to have a panadapter display and I already have three sound cards (well, one and two USB sound modules) in use with my shack computer so this isn't something I'm planning on trying. But I thought it might be worth mentioning the possibility for other K3 users. Even if the idea is a non-runner, the Cross Country Wireless receiver still looks like a very nice product. Yesterday I was surprised to receive a package, by air mail, from Greece. It was the micro transceiver module I ordered at the beginning of April from Elcom Research. I was informed that it had been sent by registered air mail, but when it didn't turn up and further emails went unanswered I opened a dispute with PayPal which was judged in my favour and the money was returned to my account on May 21st. What I received was just what you see in the picture (less the PL259-BNC adapter which was included in the picture for scale). No documentation, no indication as to what the connections to the 10-pin connector are, nothing. It is completely unusable as sent. What's more, the Elcom Research website I originally ordered it from now seems to be defunct. The only identification is the part number FC201SA on the circuit board. I typed that into Google and found that the module is an FC-201/SA Audio/Data RF Module manufactured by Friendcom in China. Google also turned up a PDF user manual on the Friendcom site, so I was able to download and print off that. From the manual it appears that Friendcom would normally supply a cable for the 10-pin connector. I didn't receive one. Without it I will have to solder directly to the pins, because although it looks like a standard 0.1in PCB header connector it isn't. The pins have a spacing of about 1.8mm. I haven't been able to find a mating connector, though I admit I haven't looked at the professional parts suppliers as with minimum order quantities and so on it isn't economic to order a single connector from them anyway. My intention with this module had been to make a micro-power Echolink hotspot. As I no longer expected to receive it I had moved on from that idea, but now it's here I guess I'll have to pay for it. I don't plan on doing anything with it until the autumn at least, as for me summer is not the time for constructional work. As regular visitors to the site will know, I'm a big fan of eQSL. I don't need QSLs for awards because I don't chase them, and in a hobby that has embraced the internet in just about every other aspect electronic QSLing seems to me to be the most logical way of confirming a contact that saves time and money. And more important than that, for me, is that it relieves me of a tiresome chore. So when I read about GlobalQSL in John Harper AE4X's blog my immediate thought was: Why haven't I come across this before? As you'll see if you follow the links, it's a service that prints QSLs on demand and sends them to the bureau. You export your log to an ADIF file, upload it to the service, pay, and the job is done. As with regular printing services there is a minimum order of 100 QSLs and the price drops if you send 1,000 or more. You can also order blanks to be sent to yourself for direct QSL requests. There is a free QSL designer program (for Windows) that you can download from the GlobalQSL site and use to design your card. As you can see from the sample above (and others on the site) the results are very professional and leave nothing to be desired. You can order 10 samples sent to you from your design for $8 to test the quality. I created an account (it's free), logged in and found that there were 14 QSLs already printed and sent to me. 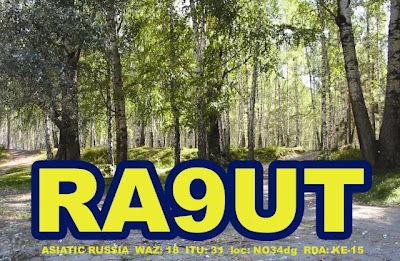 I think GlobalQSL is a brilliant idea that retains the convenience of electronic QSLing but allows you to satisfy those contacts who prefer to receive real QSL cards. 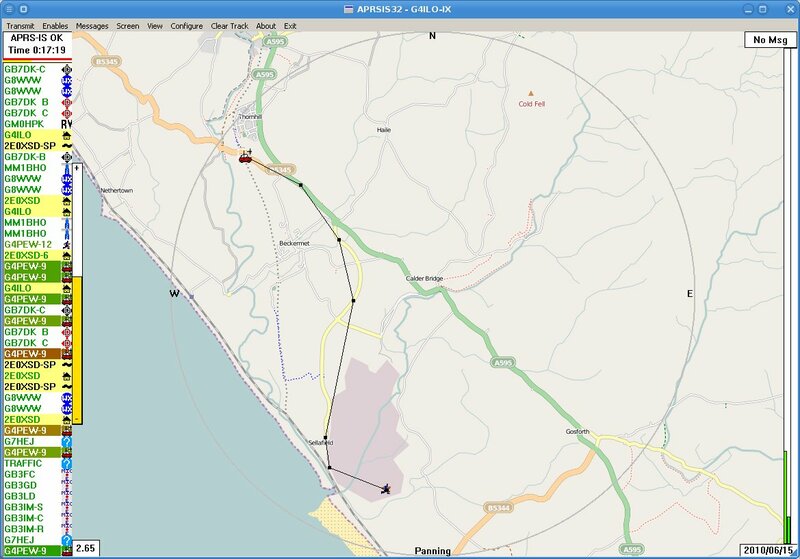 Kudos to Lynn KJ4ERJ, developer of the brilliant APRS client APRSISCE. Yesterday he read my comment that the program doesn't support transmit through the soundcard based AGWPE software yet, and today it does! So now my APRS beacons are braaping out over the Cumbrian airwaves. I have noticed a bit more APRS activity round here in the last few weeks. Today I noticed another new station mobiling around the north-east of the county - G7NZR. The info for this station showed that he was actually using DPRS, the digital version of APRS, and was being gatewayed through MB6CA. This is a D-Star simplex node set up by G7NZR. Its coverage map shows that MB6CA can't be heard in Cockermouth or Workington, so for the time being at least West Cumbria is still a D-Star free zone. When I looked at the MB6CA coverage map I was reminded of a map I saw some years ago showing the spread of grey squirrels across the county. Overseas readers may not know that the grey squirrel is an illegal immigrant - from the US, no less - and it has been gradually wiping out our indigenous red squirrels, so that there are now only a few pockets of them left. Will D-Star be the grey squirrel to analogue FM's red, gradually increasing its territory as more and more people are persuaded to make the switch, until Icom ends up with a virtual monopoly over the VHF and UHF bands? My gardener XYL Olga has been waiting for rain as eagerly as I have been hoping for a Sporadic-E opening on 2m and today she got what she hoped for. As I was shack-bound I decided to hook the IC-910H up to the computer. A few days ago I noticed to my amazement that the accessory connector on the IC-910H is exactly the same as the one on the FT-817. I could have simply used the interface I used with the '817, except that I had shortened the serial cable to make it the same length as the audio cables when used with a USB to serial adapter. My new PC has two real serial ports one of which was earmarked for exactly this purpose so I had to make up a new, longer cable before I could get started. On the audio side I needed to use a USB audio "dongle" as the on-board sound card is used by the K3. I already use a Daffodil USB sound adapter for the computer audio. The dongle I used for the IC-910H is an even cheaper, more basic one than the Daffodil and I had purchased it to make an interface for my Echolink node. It appears to be satisfactory for that. Hopefully it will also be good enough for 1200baud APRS packet using the AGWPE sound card software as well. I doubt that it would be good enough for any kind of weak signal work like WSPR, as I observed a few weeks ago that the Daffodil adapter could not reproduce my recordings of weak CW bounced off the Moon from Arecibo. But I don't plan on doing EME or even WSPR or PSK31 on VHF anyway. I set up APRSIS32 with the AGWPE software so I will be able to run an APRS gateway again when not needing the VHF radio for any other purpose. This may be useful as there seems to be an increase in APRS activity in the area. As well as Colin 2E0XSD getting set up on RF I have tracked G1TGY driving around the area. I'm not sure if I have the audio levels correct as I haven't heard any APRS to see if I can decode it and APRSIS32 doesn't support transmit through AGWPE yet. I also installed the Echolink software on the shack computer and set up my Echolink node / hotspot. This is a personal node operated under the remote control provisions of my license so it is a bit wasteful that I have to generate 5W or RF - the minimum the IC-910H will go down to - and then dissipate it all in a dummy load to stop it being heard outside my property boundary. However it is nice to have the node available again as my back is playing up a bit today and it enables me to do some ham radio from a reclining chair downstairs or even lying on the bed if I need to. Whilst setting up Echolink I noticed a conference called *QRP* which I hadn't seen before. I see that several QRP bloggers have been trying Echolink recently so perhaps we could use this conference for an occasional get-together? I'll connect to *QRP* more often over the next few days to see what if anything goes on there. This afternoon I made my first DX contact using a hand-held radio. It was a fine, warm day, so after lunch I left Olga doing things in the garden and went for a stroll with the H-520 10m FM radio. 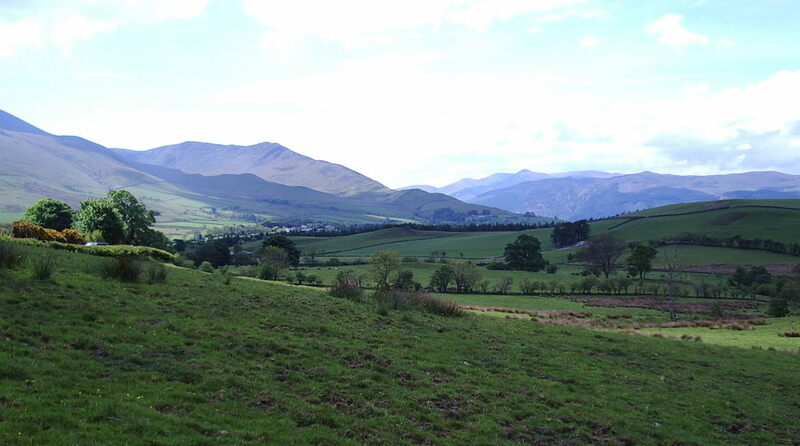 I took a footpath through fields to the north of the town that led up to the Carlisle road. It's quite high up there, with great views down into the town and to the mountains beyond. However I was only carrying what would fit in my pockets, so the camera got left behind. I used to take a 2m radio up there but I don't think I ever made a contact so I lost interest. The other problem with that path is that you sometimes have to run the gauntlet of a herd of cattle. In the UK it's illegal to put a bull into a field through which is a public right of way. However there is no such restriction on cows. They can be quite inquisitive, and there have been a few cases recently of people being knocked down and injured while walking through a field of cattle. It is quite frightening being followed across a field at less than the safe stopping distance by a couple of hundred tons of beefburgers in the making, as happened to Olga and I a couple of years ago. Shouting "horseradish sauce" at them has no effect at all! Today, fortunately, the bovine creatures kept out of my way. I found a suitable operating spot, put the whip antenna on the Intek and started calling CQ. After a few minutes I had a call from Zdenek OK1AQW, coincidentally the same station that got away from me yesterday. Today he was strength 9 on the S meter, the same as Roger G0MWE had been from just a few miles away. We moved off the calling frequency and completed a solid 5 minute QSO, kept short only because Zdenek was receiving a lot of interference from other stations on the same frequency. My report was initially 57, but was amended to 59 dropping to 51. At one point Zdenek informed me that I was coming over another British station that was calling on the frequency. He was running 100W to a quarter wave vertical and I think he was a bit surprised to hear I was running only 2.5W to a 140cm telescopic whip! 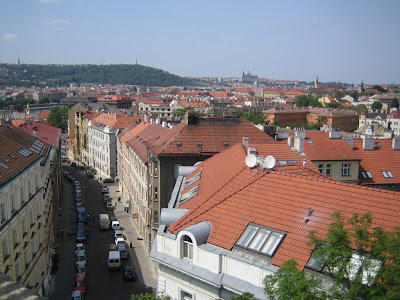 Incidentally it turns out OK1AQW doesn't live near Prague at all as I wrote yesterday. His QRZ.com page is wrong. He is actually more than 100km east of Prague, about 10km from the Polish border, in locator JO80eb. I calculate that to be a distance of 888 miles or 1,430km. Not bad for a voice contact using a battery powered hand-held radio and whip antenna. Don't you just love Sporadic E? I didn't manage any other contacts. I heard DO5DGH calling CQ repeatedly but he didn't hear me. But this was a nice taste of what is possible. Some people might wonder why someone who owns nice radios like a K3 and even an FT-817 should put so much effort into trying to make contacts using a modified hand-held CB but I think to talk to someone direct using a battery powered self contained hand-held radio, without the aid of a satellite, a repeater or internet linking, is the ultimate challenge and far more exciting than anything I could achieve even if I had the full legal power, a tower and a beam! I came a little closer to my objective of trying to make a DX contact using only a hand-held radio this afternoon. After dropping Olga off in town for a hair appointment I went up to my usual haunt Watch Hill accompanied my my 2m and 10m hand-helds. I had just stopped on the top when I heard Geoff G4WHA/P calling CQ WOTA from Kidsty Pike on the GP300 which was on my belt. He was a bit noisy as the radio only had the rubber duck on it so I foolishly decided to swap it for the 5/8 telescopic before calling him. Unfortunately in the minute or so it took to swap over the antennas I lost him and didn't hear him call again. Colin 2E0XSD called me and we had a brief chat, then I made several other calls hoping to catch Geoff or anyone else who happened to be listening. After about five minutes Colin called again to say that he was hearing activity on 10m FM. I got out the Intek with the 4 foot whip and started listening around. I did hear some activity, including what sounded like a French station down in the noise on 29.600 who was not clearing the FM calling channel. I also heard what sounded like Russian on 29.620. After numerous calls on 29.600 I heard a CQ from OK1AQW near Prague in the Czech Republic, loud and clear. I called him but he replied that I was too weak to copy. A couple of minutes later I started calling again and OK1AQW came back to me with my full callsign! I replied "OK1AQW this is G4ILO/P you are 55 in IO84 QSL?" but got no response from him. I repeated his report several times but heard nothing. I don't know if a full 4W would have made a difference, but a couple of days ago I adjusted the full power level of the H-520 back to 2.5W to try to mitigate the problem of high current draw when the SWR is less than perfect. So that was a gotaway, unfortunately. I didn't hear any more DX on 10m, but I did have a QSO with Roger G0MWE from Dearham who was using a new FT-897D and pleased to hear some activity on 10m. Roger suggested I should use a better antenna which would certainly be possible to erect up there but that would defeat the object of using the hand-held. But I'm sure with perseverance I will eventually achieve my objective. Once again our quiet English backwater of West Cumbria is in the news for the wrong reasons, this time after hitherto mild mannered taxi driver Derrick Bird went on the rampage with a sniper rifle killing 12 people and injuring 11 others - many apparently for no reason other than being in the wrong place at the wrong time - before killing himself. This kind of event is traumatic at the best of times, but in a sparsely populated area there are few people who don't know, or know someone who knows, someone who witnessed or has been affected by the atrocity. Britain has very strict gun control rules. Gun owners have to give good reason why they need to own a weapon and confidential enquiries are made as to their soundness of mind before granting permission. Derrick Bird had apparently legally owned his weapons for 20 years. But understandably questions are now being asked as to why people who have no professional need to own weapons capable of such carnage should be allowed to keep them in their house. The sporting guns lobby has reacted with, it seems to me, rather disrespectful haste, to stem cries for even tighter controls, using arguments such as banning guns would make it impossible for Britain to host the Olympics. I doubt if the relatives of the 12 innocent people who were killed could give a damn about the Olympics at this moment. There are many other silly arguments being raised against tighter controls. It is argued that much gun crime is carried out with illegally owned weapons, so making it harder to legally own one wouldn't make a difference. But if Derrick Bird and others who use guns in crimes of rage or passion had to obtain them illegally first they would probably just resort to shouting or using their fists like the rest of us. Another daft argument is that cars can kill and no-one advocates banning the use of cars. But quite apart from the fact that cars are useful to almost everybody whilst guns aren't, it is also true that serious road accidents are examined to see if road safety legislation could be improved in order to try to prevent such accidents in the future. So I think that examining the laws regarding gun ownership is entirely appropriate. If people own guns solely for sporting reasons, do they need to keep these weapons at home? Perhaps they should be securely kept at a licensed gun club or a police station and signed out for a specific period of time and purpose. If Derrick Bird had not been able to get his hands on his weapons whilst he was thinking murderous thoughts, 13 people would still be alive today and 11 more would not be in hospital. Can anyone seriously argue that their sporting freedom is more important than that? When using a hand held radio with a long whip antenna for more gain I often prefer to use a speaker mic so I can hold the radio in a steady, upright position. I have a speaker mic for the Kenwood TH-F7E (which fits the old TH-205E as well) and I have one for the Motorola GP300. But needless to say neither of them fit the Intek H-520 Plus 10m rig because the wiring and pin spacing is different. The official Intek speaker mic is rather expensive so I looked on eBay and found a speaker mic for "Alinco Icom Standard 2-pin" with the correct pin spacing for less than £7 including postage from Hong Kong. When it arrived I decided to check what the audio sounded like by listening on the K3 while I made a call. The mic keyed the radio up but there was no audio. To make troubleshooting easier I swapped the antenna for a dummy load and audio was then heard! I then tried a variety of different antennas and power levels and was soon pulling my hair out. I would hear audio with the dummy load connected and none as soon as I switched to an antenna. Eventually I tried the very short antenna supplied with the H-520 on the lowest power setting, 0.1W and I heard audio. It was looking very much as if the presence of radiated RF was somehow interfering with the audio. But the amount of RF required to cause the problem must be small as 0.1W on any of the larger antennas resulted in no audio from the speaker mic. I didn't know whether the RF was causing a problem with the microphone or the radio. I tried clamp-on ferrites at both the mic end of the cable and the plug end but neither made any difference so I was none the wiser. This particular made-in-China speaker mic is held together with screws that require a nonstandard five pointed key to undo so I couldn't look inside to see if it used screened cable. I decided to give up on that speaker mic and do what I could have done in the first place if I hadn't thought spending seven quid would be an easier solution. In my junk box was the business end of another cheap Chinese speaker mic from which the cable had been 'borrowed.' I noticed in the past that the curly cables used for these speaker mics are often not screened. I happened to have a length of stereo audio cable with each channel separately screened. I wired this up to the spare speaker mic and attached suitable 2.5mm and 3.5mm jack plugs to the other end. When I tested it I now had transmit audio even on high power with the 4 foot telescopic whip! At this time I don't really know whether the mic I bought was at fault because I don't have another radio that uses the same size plug spacing to test it with. Given that I have been less than impressed with other aspects of the H-520's performance I wouldn't be surprised if it wasn't the radio that has inadequate filtering for RF picked up on the speaker mic cable. I have never owned a Ten-Tec transceiver (although I once built and used one of its transverter kits) but I always thought that the thing the company's products were most renowned for was their good support for CW operation and excellent QSK. So I was surprised to visit the Ten-Tec website a few days ago and see beneath the logo the slogan "The SSB Company." Obviously CW isn't seen as so important these days. In the last couple of years Ten-Tec has dropped its kit range, its QRP Argonaut transceivers and most recently has been in the news for announcing that it will be rebranding the Chinese-made HB-1A QRP CW transceiver as a Ten-Tec product. I suppose someone somewhere has decided that this makes commercial sense but it doesn't seem to me like the way to hold on to a reputation as an innovative indigenous American manufacturer of quality radio products for the discerning amateur. Can APRS count for contacts? Colin, 2E0XSD, raised an interesting question this afternoon in the Wainwrights On The Air forum when he asked what the rules were regarding making contacts using APRS. I confess that I hadn't thought about it and haven't come to a conclusion at the moment. For those who think that APRS is merely a way of using ham radio to transmit position reports that can be received and tracked I should explain that it is a lot more than that. One of its best features, if one that is not all that widely used, is the ability to send text messages to other APRS users. For example, if you see someone's position on the map and would like to contact them on the radio you could send them a message to ask whether they are on the air and what frequency and mode they are using. You could use APRS text messages to exchange exactly the same kind of information with another station that you might exchange in a normal digimode contact - signal report, name, QTH, locator and so on. This could arguably constitute a valid contact. But most of the time APRS users are not in direct radio contact with one another so the messages may be passed with the aid of digipeaters: stations that receive an APRS packet and rebroadcast it. 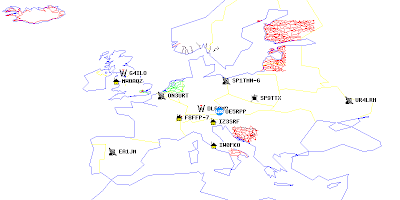 Even more common these days is the use of internet gateways (IGates) that route messages between APRS stations via the internet. There are also an increasing number of APRS users who use mobile devices and the cellular network to send and receive APRS. So I have come to regard APRS as a kind of hybrid system that is not purely amateur radio and I do not regard conversations held using APRS messaging as radio contacts in the sense that I would log them, QSL them or use them to qualify for an operating award. But that's just me. If two people exchange APRS messages over RF with no digipeaters or IGates involved, is there any reason that this should not count as a contact? I must confess to having mixed feelings about APRS. When I first found out about it I thought it was an extremely useful system and I still do. My wife Olga worries when I go walking in the hills on my own and likes being able to see where I am at any moment on a map on her computer. If I don't return she will know my last position and could send someone to look for me. And it is a useful way to alert WOTA summit chasers to the fact that you are approaching a summit that you are going to activate. But I quickly became disappointed when I discovered that this functionality could not be achieved if you relied solely on amateur bands RF. Then I discovered Lynn KJ4ERJ's program APRSISCE which can run on a data enabled mobile phone and connect to the internet-based APRS infrastructure and I was able to get the kind of usage I envisaged from it. (In this part of the world even the cellular data coverage isn't 100% but it is still a big improvement.) But although I now use the mobile client whenever I am on some radio related outdoor activity, I found that using an internet connected client destroyed the radio interest because I could now communicate using APRS with anyone, anywhere with the same kind of reliability as sending an SMS or an email. APRS is too useful to hobble it by insisting on using only amateur bands RF as the transmission medium. Because of that I don't feel it can be used to make contacts or QSOs in the sense that is generally accepted within the hobby and I'm not convinced that it would be right to make an exception for message exchanges that are "direct." But I'd be interested in other people's opinions on the matter. In British English, a "cockup" is rude slang for a mistake, usually implying carelessness. Great Cockup is the name of a rather undistinguished grassy Wainwright summit near the northern edge of the English Lake District. I don't think there is any connection between the slang meaning and the name of the hill. But whilst my decision to go for a walk up Great Cockup on Bank Holiday Monday wasn't a mistake, from a radio point of view it wasn't a success either. I parked the car near Overwater and set off on quiet lanes and then a grassy track on the western side of the fell with great views over Bassenthwaite Lake. The summit was reached after about an hour of walking. Despite being the end of May a cold north westerly breeze was very much in evidence on the summit. By descending a few feet it was possible to get away from the breeze, but as soon as it dropped clouds of black insects appeared and covered everything. It was necessary to brave the full force of the wind in order to eat the lunch Olga had prepared without an accompaniment of fresh insects. Despite this one managed to find its way inside the Intek H-520 - it was still walking around the inside of the display window this morning! Lunch over, I got the radios out. 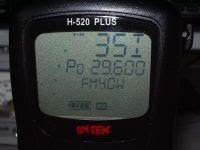 I had taken the Intek H-520 hoping to make some DX contacts on 10 metres, but despite making numerous calls on the 10m FM calling frequency, 29.600MHz, I had no takers. There was obviously some enhanced propagation as I heard a French station and also some activity on a repeater on 29.660MHz. I heard a French station call CQ on 29.600 and when I replied to him he said "UK stations, please QSY to 29.205MHz." I was unable to oblige because a) my radio only tunes exact 10kHz multiples and b) when I did try to transmit anywhere near there the radio cut out due to the SWR being too high on that frequency. I'm afraid the H-520's intolerance to even moderate SWR renders it almost unfit for purpose and if I hadn't modified it to work on the 10m band I would probably consider returning it under warranty. As it is, probably the only option is to reset the power control to limit the power to 2W on the "4.0W" setting. As noted previously, when received the radio delivered less than 3.0W even on the UK CB band and I now suspect this was done deliberately by the manufacturer to try to mitigate this problem, knowing that the majority of CB users would be none the wiser. While listening for the French station I heard what sounded like an APRS packet on 29.210MHz. I don't know if that is a recognized APRS frequency but it would be interesting to monitor that frequency with a decoder to see what is being transmitted. I tried the Motorola GP300 on 2m with the 5/8 telescopic antenna but was unable to raise any contacts on that band either. I did hear some activity on the channel set up for GB3EV but which I suspect may be the GB3BT repeater on the north east coast which is on the same frequency. 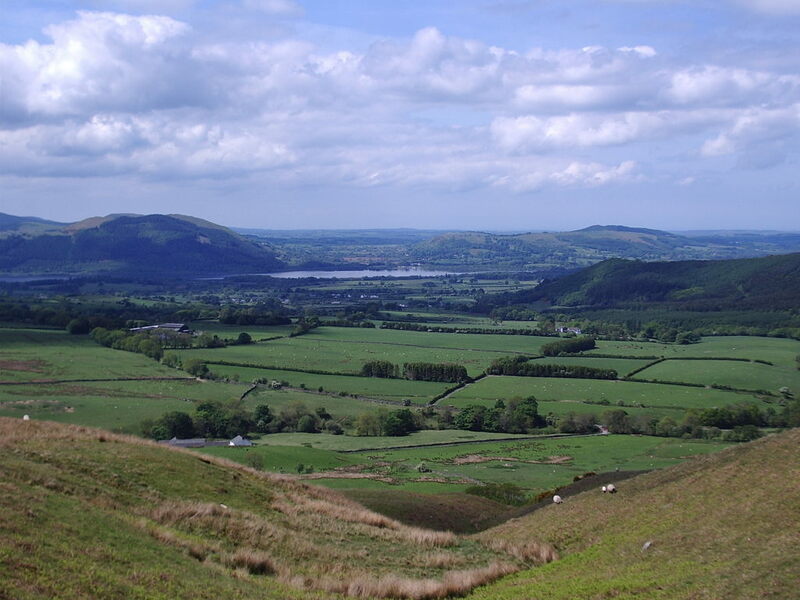 Back home I heard and worked Colin 2E0XSD/P who was on Ling Fell (behind the 'hump' on the left of the middle photograph) using the H-520 inside the shack with the 4ft. whip antenna. On 2m I worked Derek 2E0MIX/P who was up on Scafell Pike, England's highest mountain. 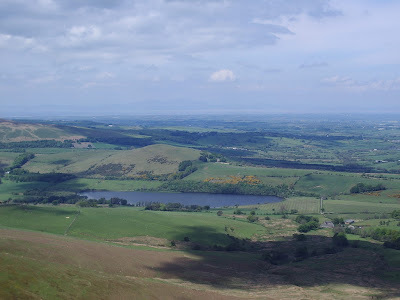 So had I gone out a bit later I would probably have made not just a couple of contacts, but a couple of summit to summits. Never mind. It was a pleasant walk and now I have the excuse to go again another time.